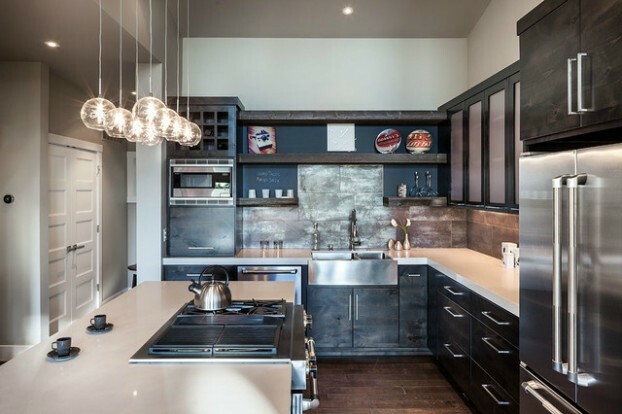 Kitchens today are the focal point of the home, and because it is the modern home’s most active area, lighting is crucial. 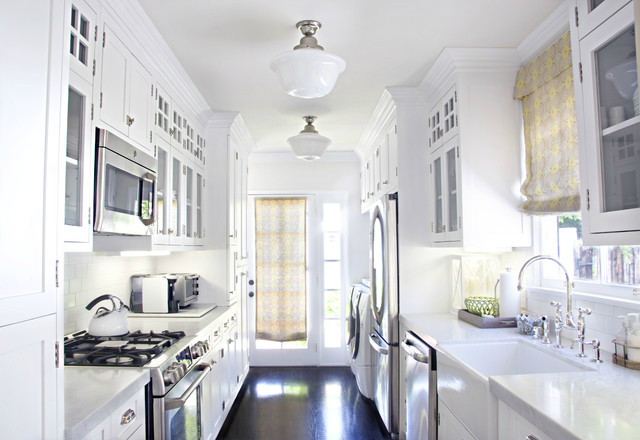 Small kitchens can easily get by with a center light fixture on the ceiling and task-lighting beneath a cabinet. Larger elaborate kitchens require a combination of accent and task lighting. 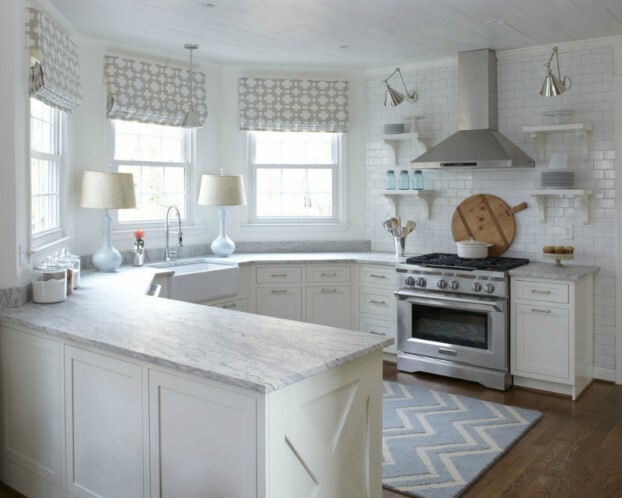 In addition, because kitchens have become more than a place to eat, lights need to be longer lasting and multi-functional in order to create an idyllic atmosphere for various activities and to prevent accidents and eye-strain. 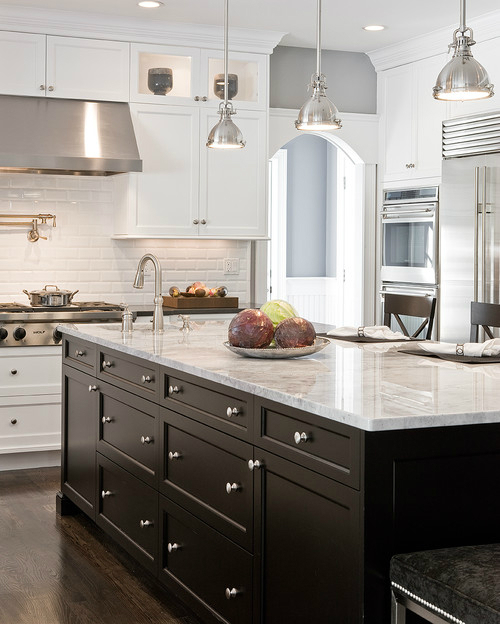 While upgrading your kitchen, you may have the means to work with a professional interior designer or architect in order to get your lighting just right. Nonetheless, those of us on a much smaller budget look for simpler ways to enhance our kitchen lighting without all the expense. Here are a few suggestions on how to get your kitchen lighting perfect. A lovely hanging lamp will offer adequate task lighting while providing additional style and character to the space. It doesn’t have to be an expensive model and interesting color or shape will do. 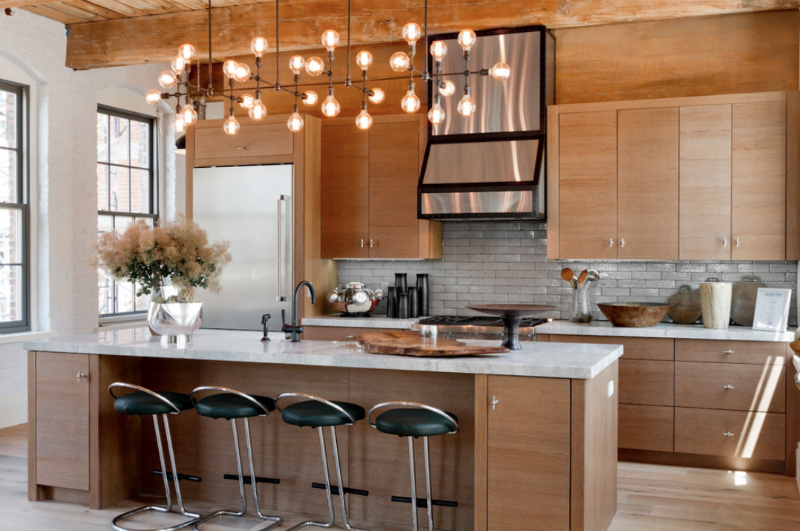 Standard kitchen lighting can be accomplished with a fancy chandelier. This type of lighting can be used along with other lighting in the same space. Moreover, semi-transparent glass chandeliers are ideal for the kitchen as they are much easier to clean than shades made from fabric. Image: Victorian Hotel Pendant selected by Benjamin Dhong Interiors. 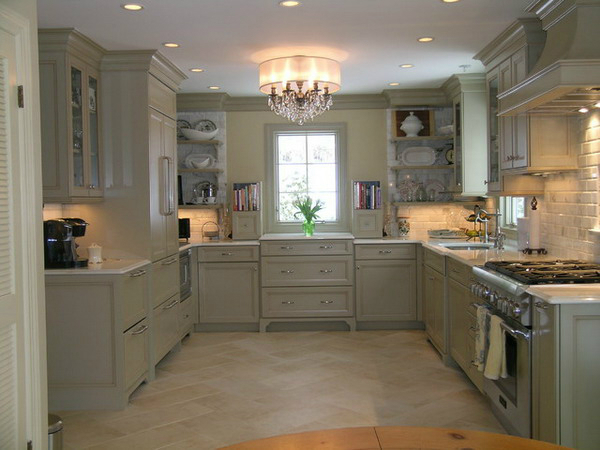 The cabinet color is Benjamin Moore’s ‘Hazy Skies’ OC-48. 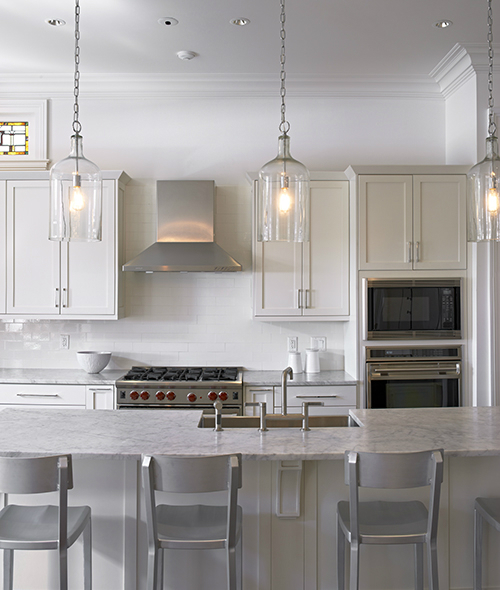 Recessed down-lights work fine if you are looking for even illumination over your sink or range. 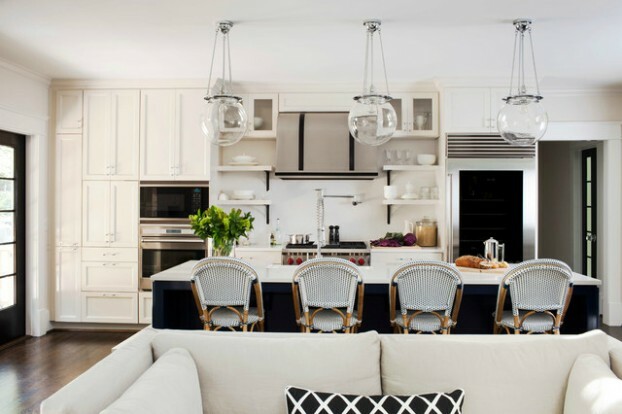 You can find a number of fancy and stand-out light designs, like metallic, that will add a touch of pizzazz to your kitchen décor, if that’s what you are looking for. A track or rail system is a doable alternative if you are refurbishing your kitchen and access to the area above the kitchen is difficult. 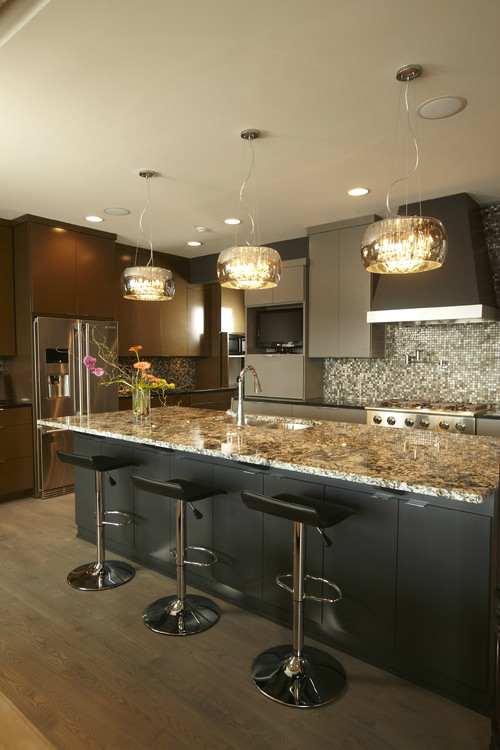 This type of lighting will illuminate your counter-top in a jiffy. 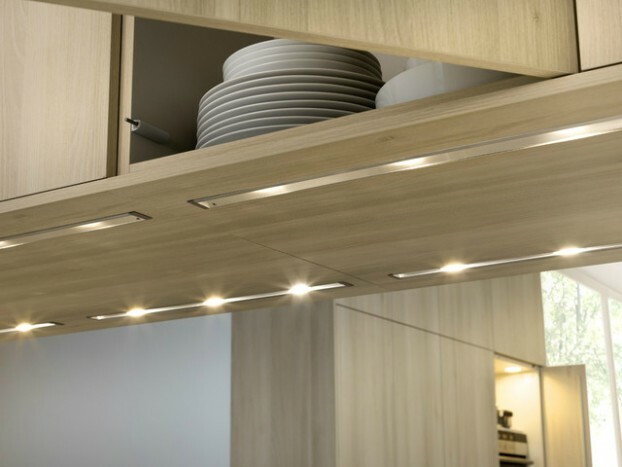 You can find numerous styles for under cabinet lighting such as miniature track lights and energy efficient-fluorescent lights. Remember to install under cabinet lighting toward the front, not against the wall, so that the lighting can illuminate evenly. You can also install a dimmer with your under cabinet lighting. This will add depth and dramatize the overall effect while saving energy in the process. This section of the kitchen will require task and general lighting. 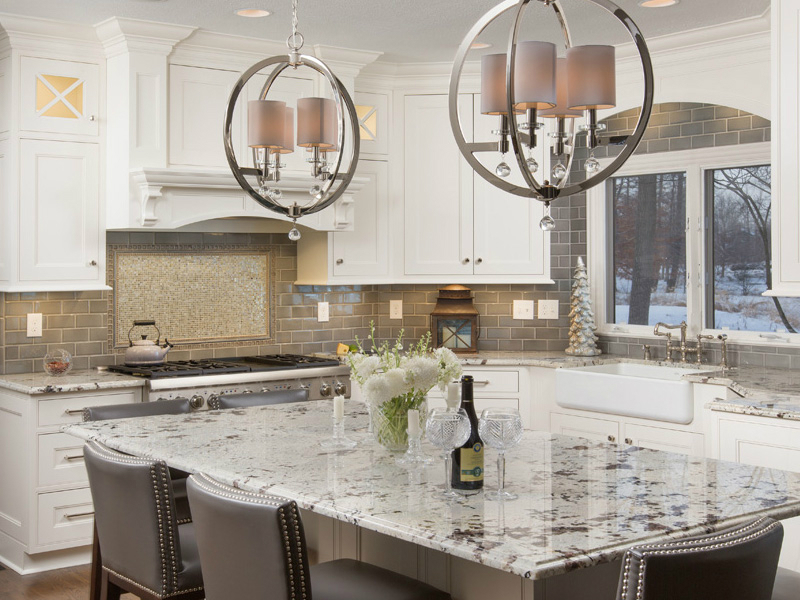 To add style to this area try putting a group of miniature pendants together. 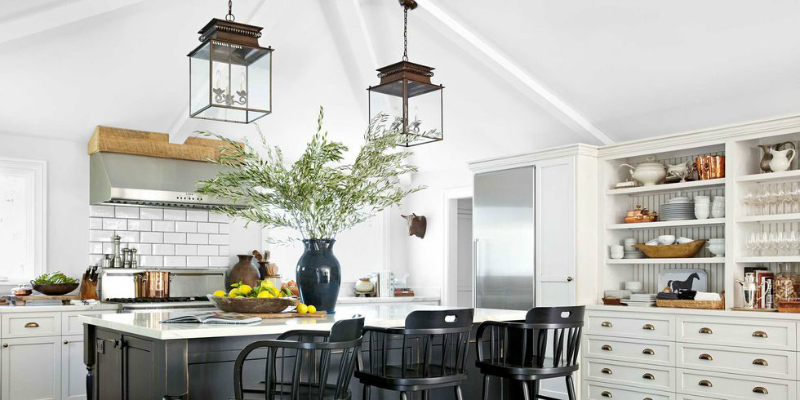 For the ideal look, install one pendant for every two-feet of counter space and try using an uneven number of pendants to establish a better balance. 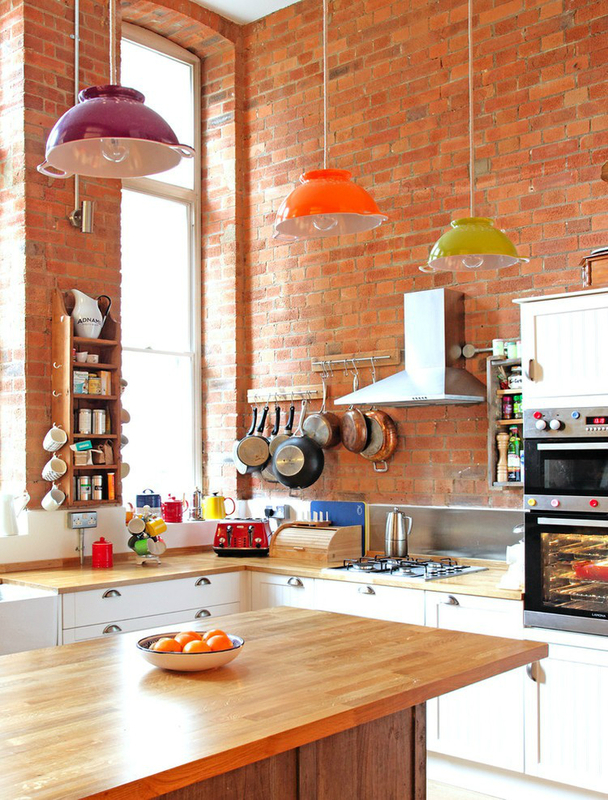 Three colourful custom-made colander lights add a splash of colour to this open-plan kitchen by Avocado Sweets Interior Design Studio, in a converted Victorian school house. 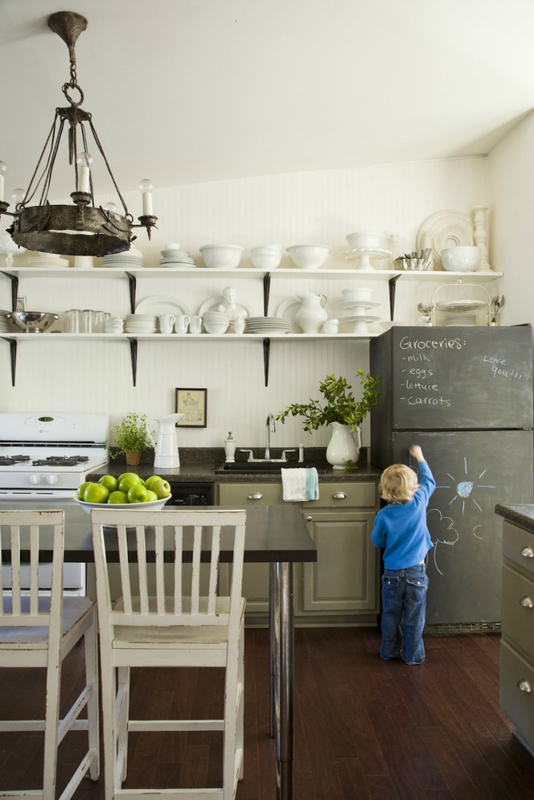 The kitchen island is custom-made out of a vintage oak chest. 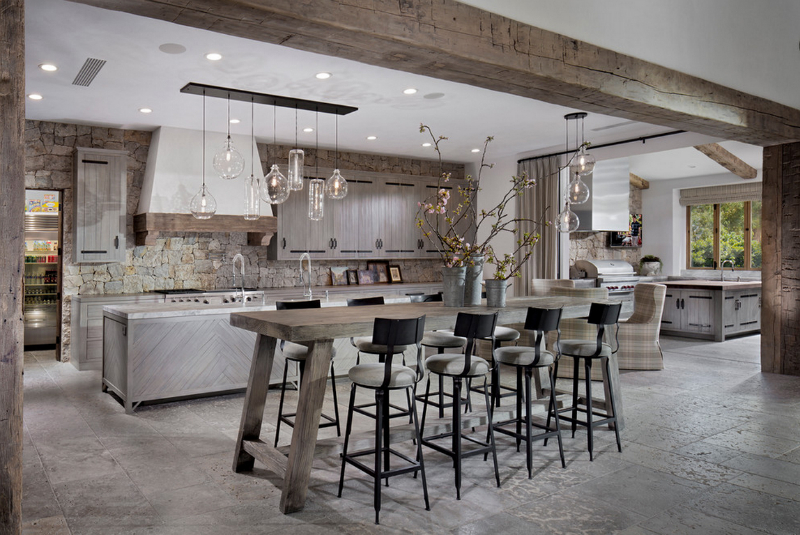 This transitional kitchen by Fredman Design Group, shares both rustic and industrial elements.I love the Marshall Pendant Lamps . 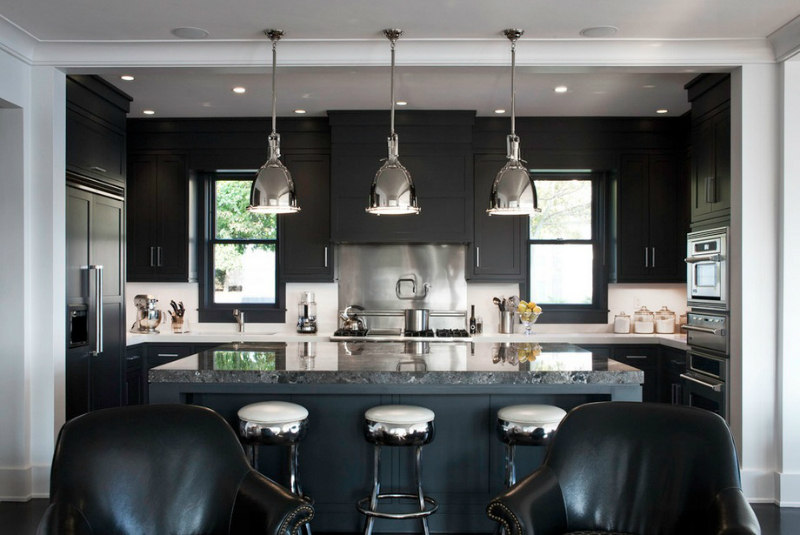 The statement custom black chandelier by Willow lamp, for Nicole Hollis, creates a large focal point over the futuristic stainless steel island. This beautiful kitchen by Linda McDougald Design, is designed for functionality with a 48” Subzero refrigerator and Wolf range. Add in the marble countertops and industrial pendants over the large island and you have a stunning area. 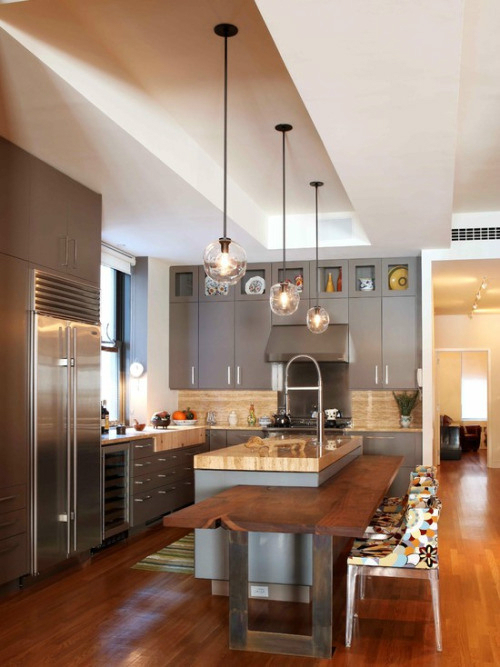 Kitchen by David Howell Design with Canopy 422 lamp by Oluce. 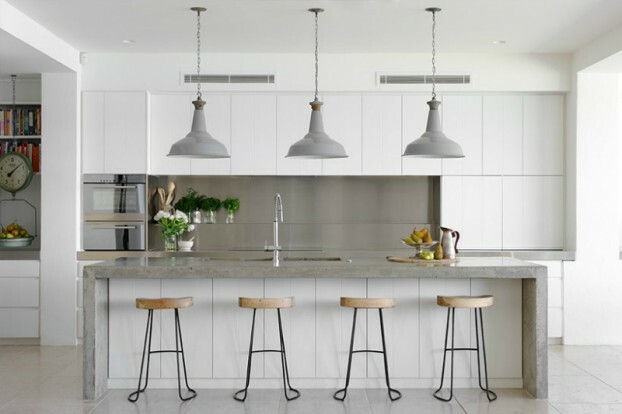 The addition of three gold pendant lights in this kitchen by Arent&Pyke, creates a visual balance by drawing the warm golden tones of the floor and benchtop to a higher visual point. Striking and modern, yet simple and classic. 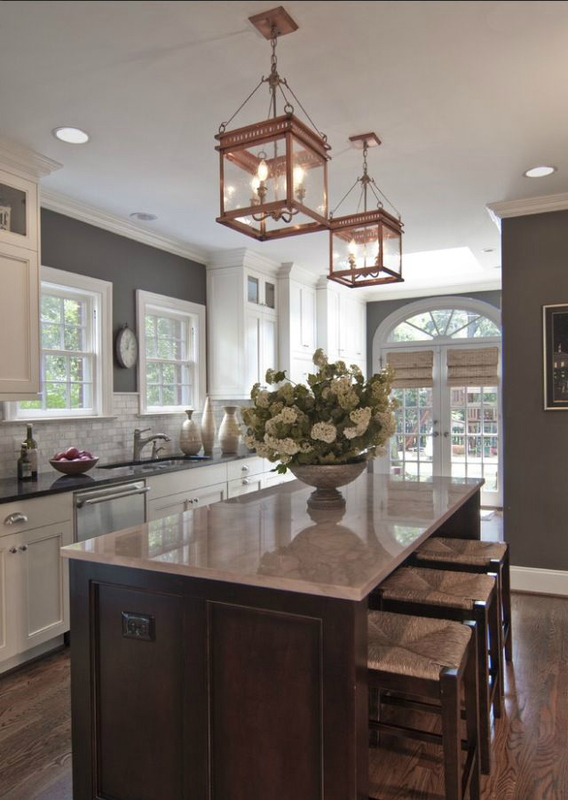 Dreamy kitchen island by Pinemar with lights from Val Maitino Antiques. Kitchen by Terracotta Design Build with Classic Globe Pendants. 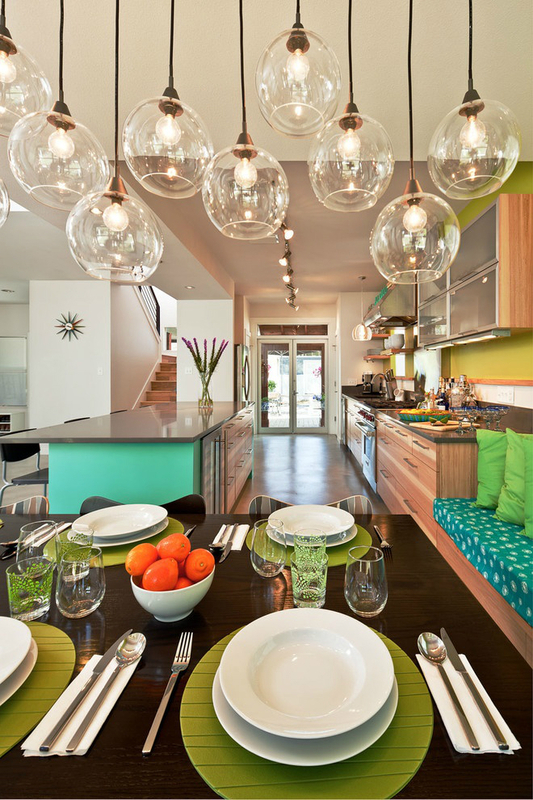 This fixture is a great way to make a bold yet simple statement. Globe size changes the look: choose the 12″ for a schoolhouse approach, the 14″ for a versatile style, or the 18″ to create a focal point that looks anything but basic. 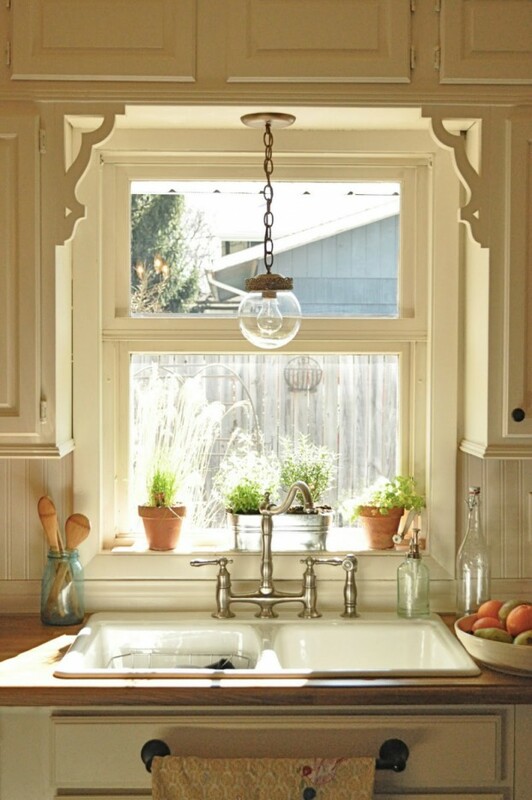 Beautiful vintage kitchen by Lauren Liess Interiors with amazing antique light. Kitchen by Carpenter & MacNeille. The glass pendants are Large Rustic Glass Pendants right from Pottery Barn. 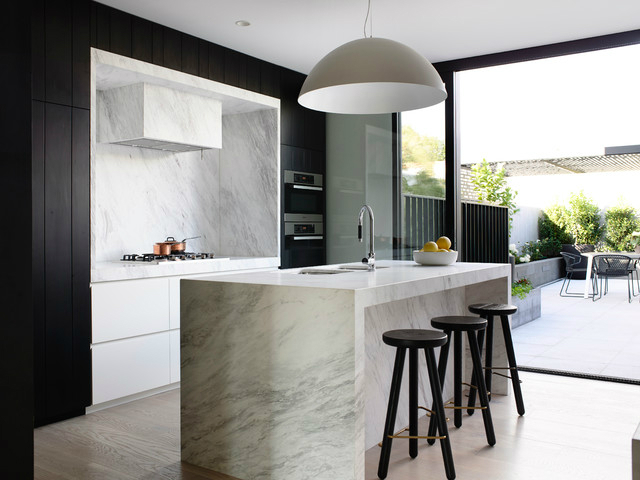 Rocky Ledge Kitchen by LDa Architecture & Interiors. 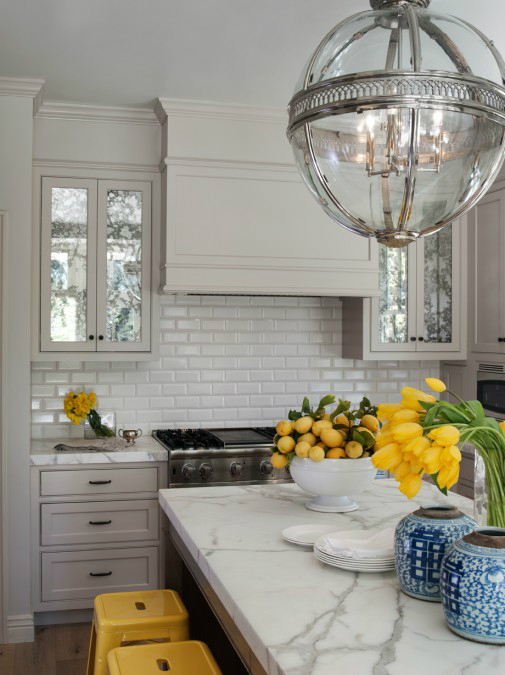 This classic polished pendant adds shine and sophisticated nautical style. 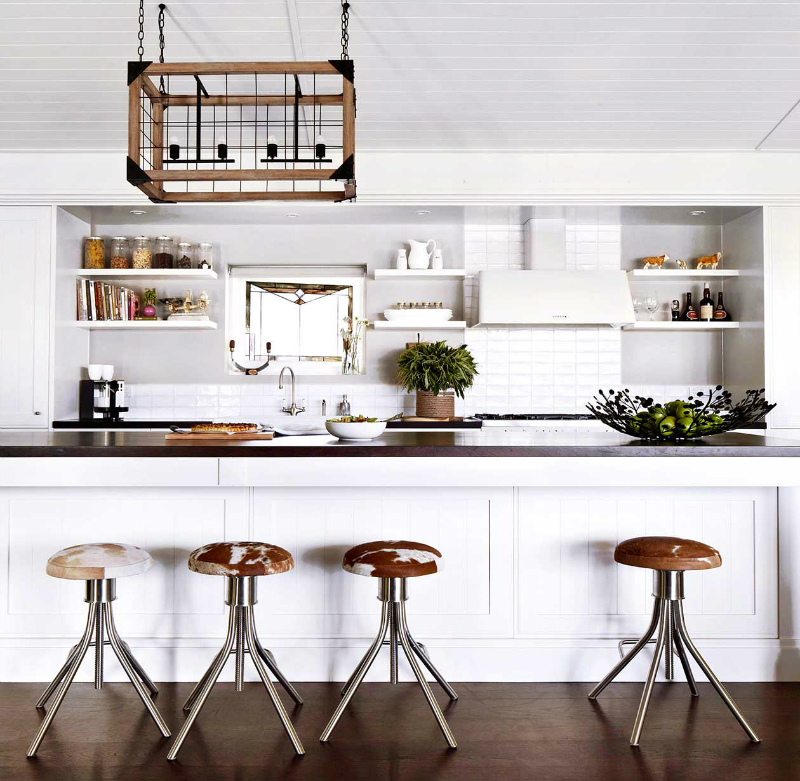 Christina Svaneeng Mertz the designer behind SwanfieldLiving has selected an antique lighting for her kitchen. 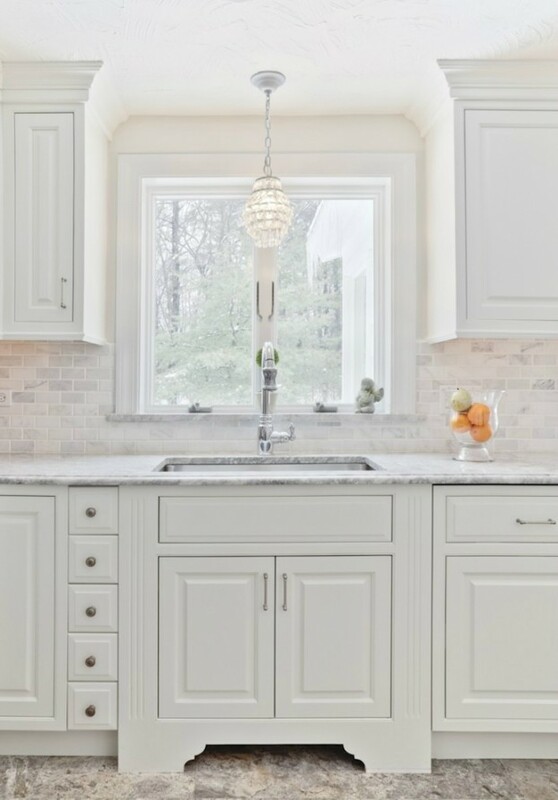 Traditional Kitchen design by Boston Kitchen And Bath Venegas and Company with Pelham Pendant by Hudson Valley Lighting . Contemporary kitchen by Titan with semi flush ceiling lights . Kitchen by valerie pasquiou interiors + design with counter height farm table and Lindsey Adelman pendats. 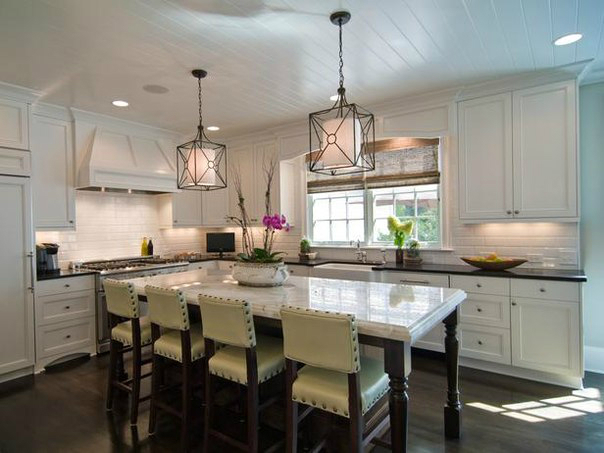 Contemporary kitchen by Carolina Design Associates with sophisticated pendant light that has a touch of old-world charm yet still manages to make any space feel modern and elegant. You can find the pendant here . 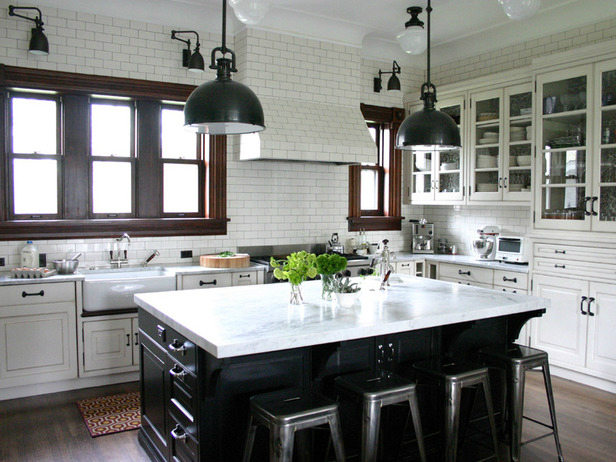 Black kitchen by Candace Cavanaugh with Southampton Pendant in Antique Black. 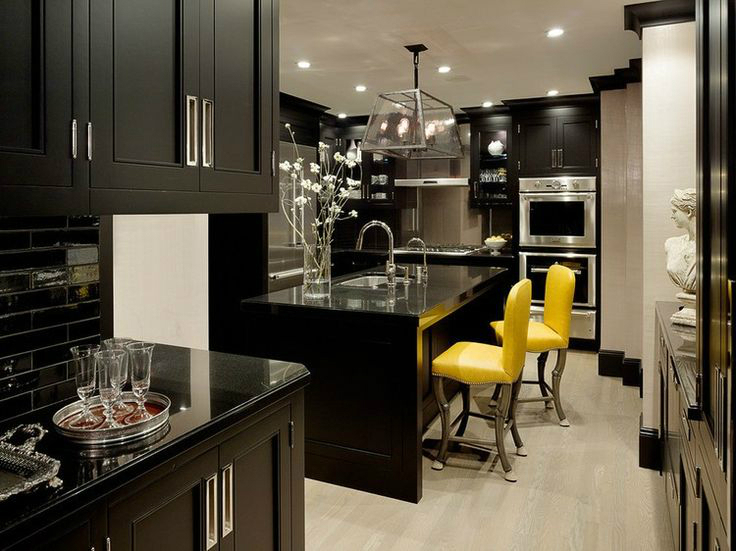 Contemporary kitchen by Highmark Builders. 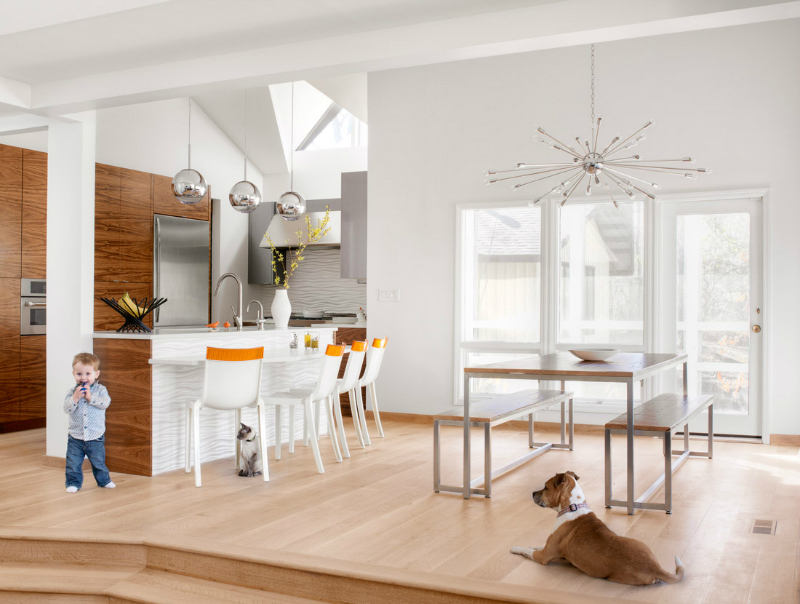 The Pendants are ET2 Contemporary Lighting’s Sense Pendant . Chef’s Delight contemporary-kitchen by Joel Kelly Design with custom lighting. Completely customizable from size to color, this fixture is made up of two sheets of hanging glass hung from the ceiling. 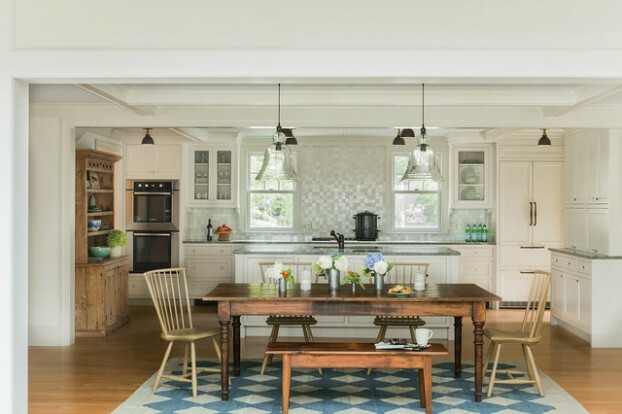 Farmhouse kitchen by Danielle Trippett with Eufaula Rectangular Chandelier by Currey & Company . 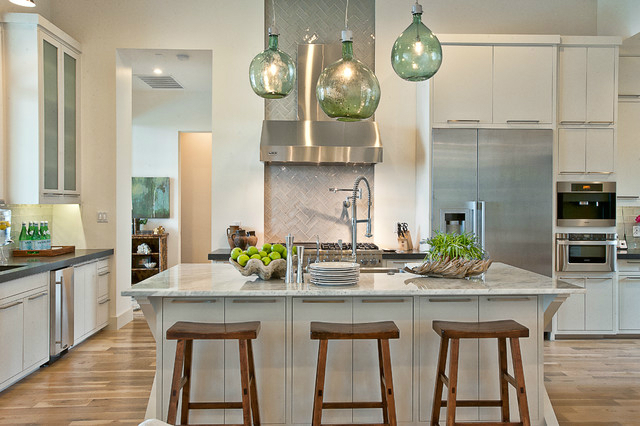 Large scale pendants grace the kitchen of The Concord Green Healthy Home. Find the two arm wall lamps here. Sometimes, one grand gesture can pull an entire room together. 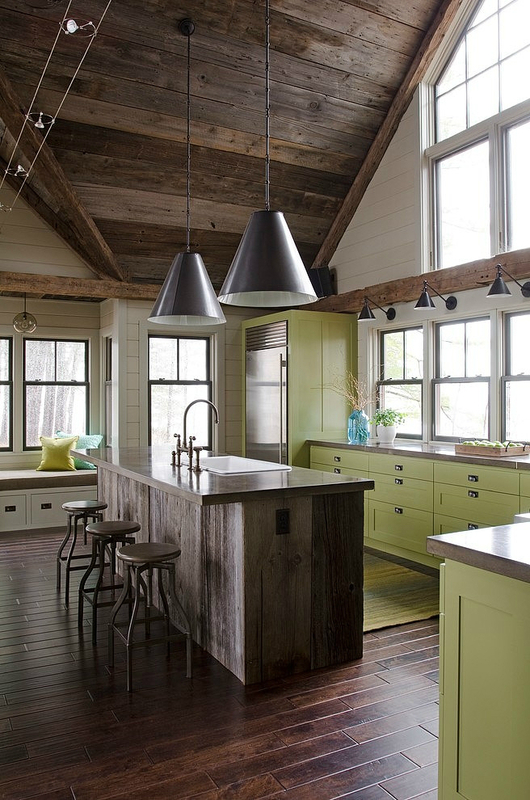 I designed these oversize pendants, hung from the ridge beam of the gable roof 16′ up, to make a bold statement in the Concord Green Healthy Home’s kitchen. Crafted by Carol Collord of Creations by Carol, the 100% linen shades with exposed twine stitching provide a soft, Belgian farmhouse accent to the light and airy space. 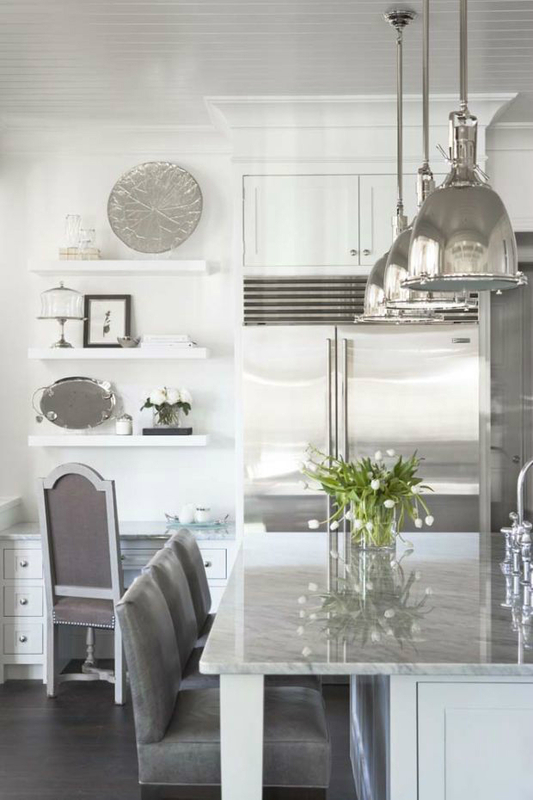 Functional and timelessly beautiful kitchen by Diane Bergeron Interiors with oversized pendant lights in polished nickel by Ralph Lauren. 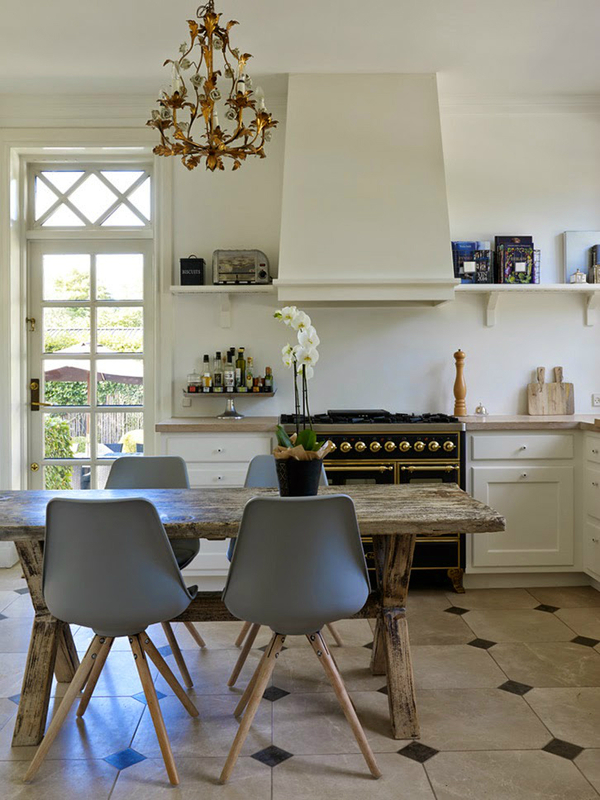 Traditional kitchen by The French Mix Interior Design with Glass Jug Lanterns. These clear glass jug lanterns have both repurposed-vintage charm and a touch of modern flair. The kitchen in a relaxed beach side cottage by Muse Interiors. The Sorenson Lantern from Remains Lighting is netted in a handwoven wire. This versatile lantern references a form of historical factory lighting where the glass was netted for safety. 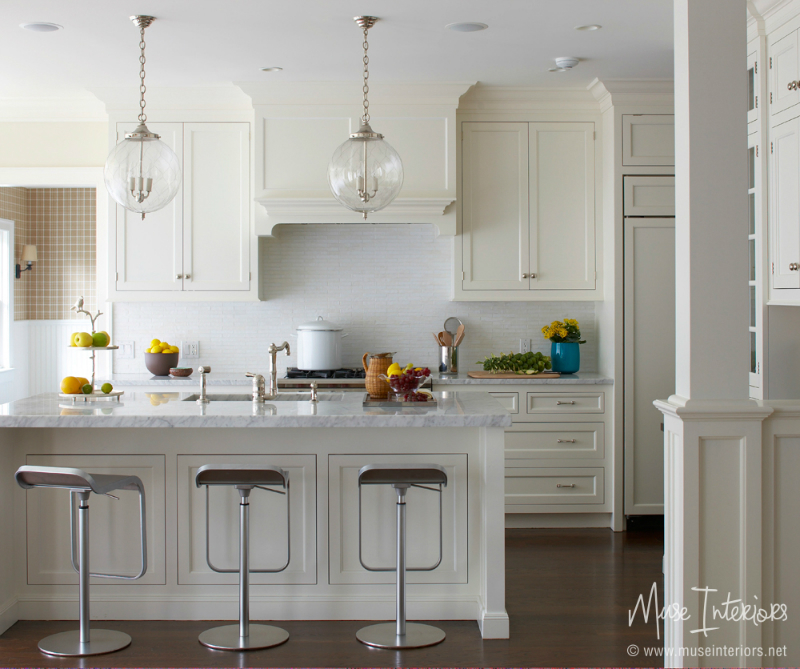 Modern functioning kitchen by Marlene Wangenheim of Interiors By Design with light fixture by ABC. 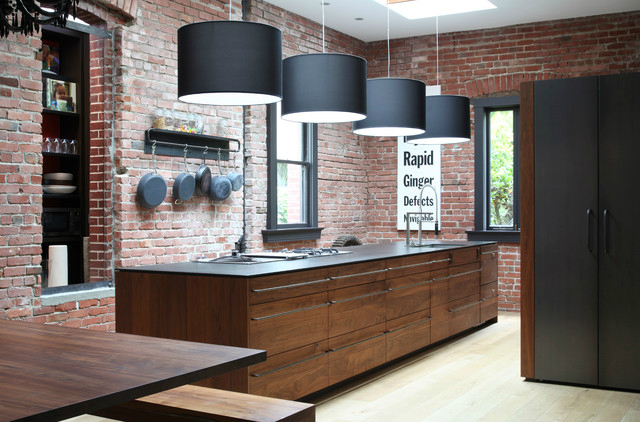 Kitchen by Hugh Jefferson Randolph Architects with beautiful pendant lights by circa lighting. The hanging light fixture was made by randomspaces, designed by mim design. 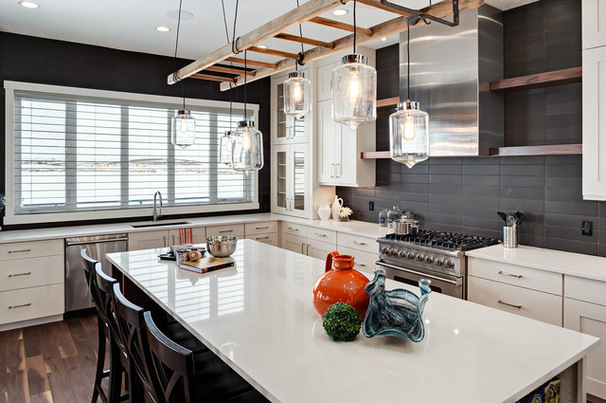 Rather than several pendants, try one wide fixture like this custom made by Huniford. Transitional kitchen by Buckingham Interiors + Design. The polished nickel and crystal pendants were from New Metal Crafts. I love the color scheme and the simplicity of the design of this kitchen by Walter Barda Design. Beautiful pendulum lamp with iconic design that matches both the modern, classic, minimalist and retro interior decoration. High five. Industrial modern chandelier suspends five glass globes from black iron canopy. Interior design by Loop design. Mediterranean kitchen by with interesting pendant. Pottery Barn Paxton Glass 8 Light Pendant is a similiar. Glass lighting specialist Rothschild & Bickers has expanded its ‘Pick-n-Mix’ range with new sizes, colours and finishes. As its name suggests, the series allows any combination of shapes and materials. Pendant lights in four different shapes will now be available in more than 20 colours and five metal finishes. Kitchen by Union Studio, Pendats are SOSPENSIONI TESSUTO by Penta, Cabinetry by “The Last Inch, Inc”. 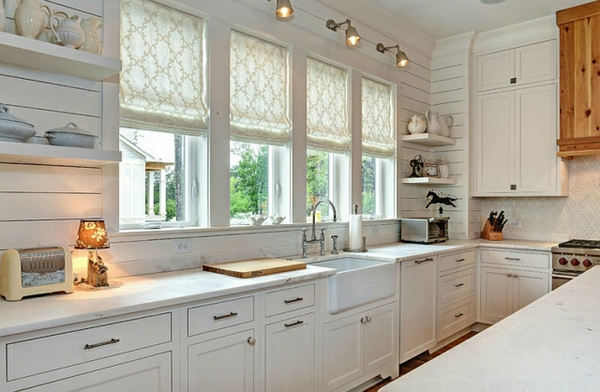 Traditional kitchen by Carolina Design with John Street Collection Lanterns. 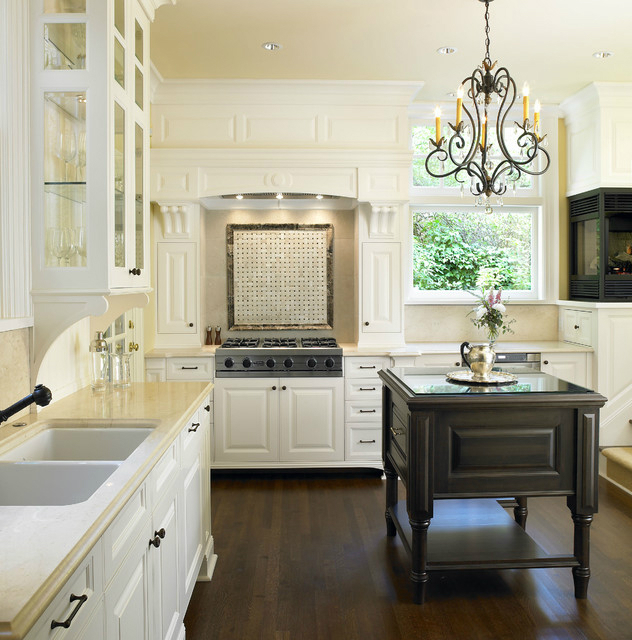 Traditional kitchen by The Sky Is The Limit with beautiful chandelier by bellacor. 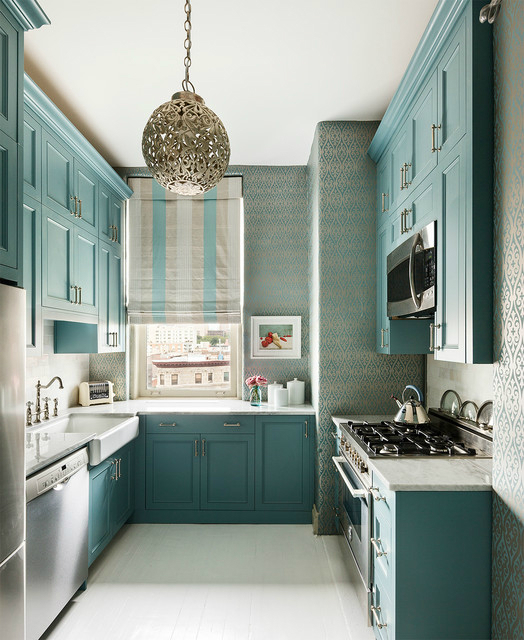 Kitchen by Kristina Crestin Design with goodman hanging lamp. Suburban kitchen remodel by Lisa Gabrielson for a crisp urban farmhouse look. 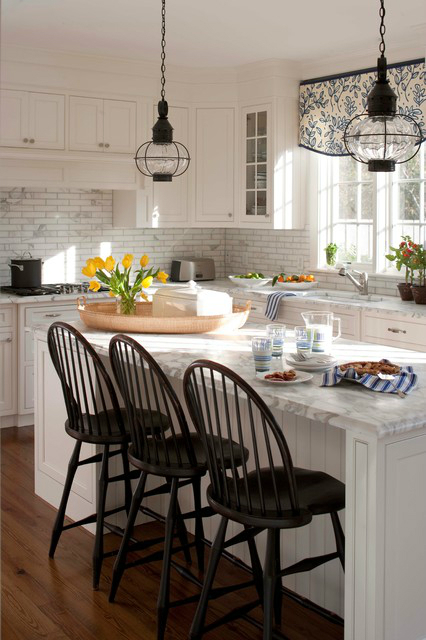 Traditional kitchen by kitchen kraft with Metropolitan pendants. Trickle Creek Custom Homes made something a little different by hanging regular pendants on a wooden ladder to add a rustic effect. 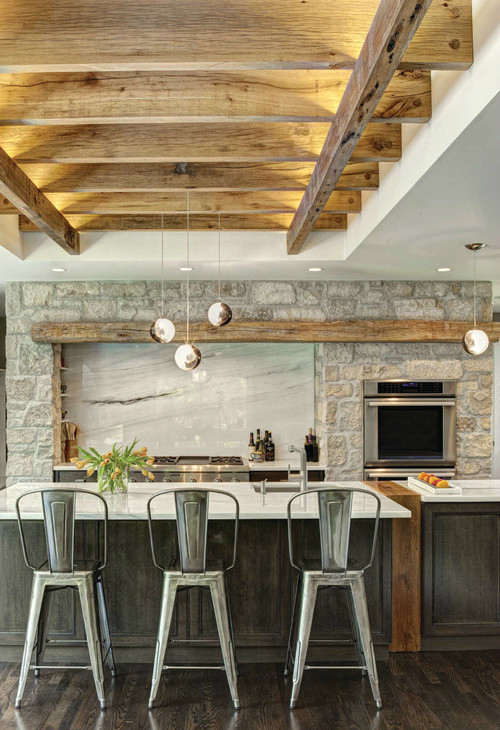 Transitional kitchen design by austin architect Cornerstone Architects. 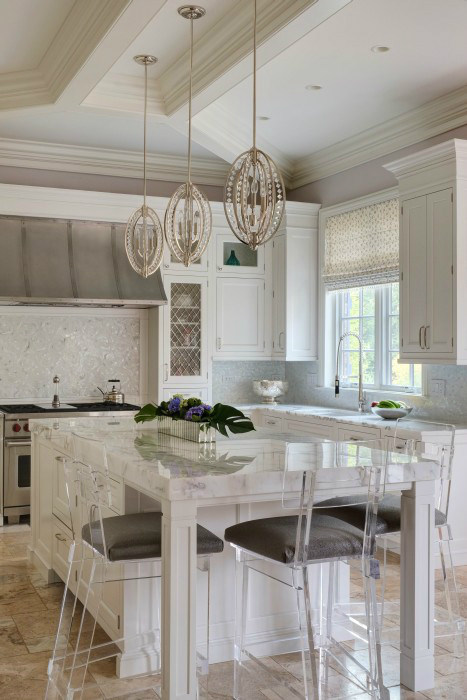 I love these chandeliers by Chadwick Design in this beautiful contemporary kitchen by Andrea Schumacher Interiors. 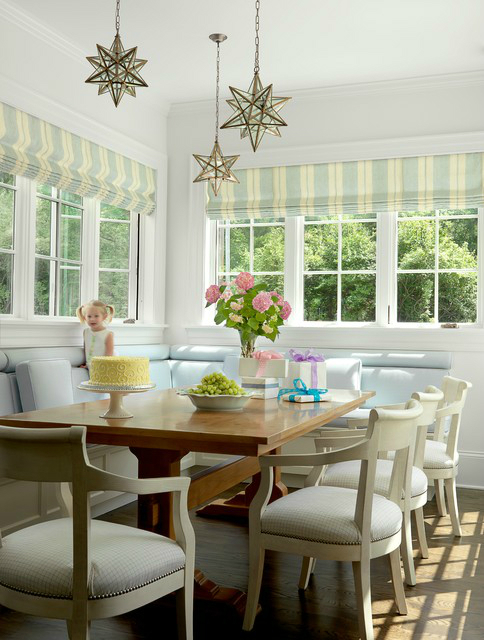 Don’t be afraid to go big; this big Clobe lantern by Alison Spear for Stephanie Odegard looks striking. 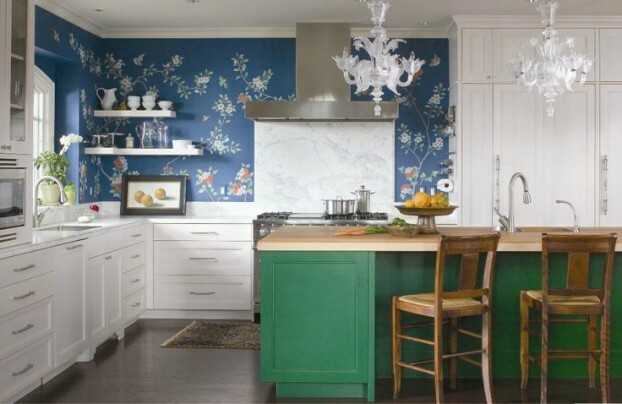 Cabinets’ paint is Benjamin Moore’s Hemlock. Interior design by Sheila Bridges.